Haringey Green Party Blog: The Great Royal Mail Robbery – But Will They Get Away With It? 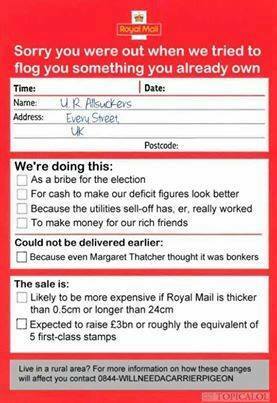 The Great Royal Mail Robbery – But Will They Get Away With It? 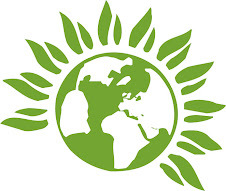 I was pleased to see that the Green Party conference unanimously passed the motion to stop the privatisation of Royal Mail and support the campaign by the union the Communication Workers Union (CWU) to fight the sell-off. I worked for BT for twenty years, joining just a few years after it was privatised in 1984 which was the first of the public utilities to be sold off by the Thatcher Tory government, but was followed by many more, some under the subsequent Labour government, in an ideological process of robbing the poor to the benefit of the wealthy. In the time that I worked at BT it did change a lot, going from 250,000 employees down to something like 80,000 by the time that I left, and I think even lower now. When I started working there I did think that there was a plausible argument for privatising a business where thousands of people had to wait six months or more for a telephone connection in an industry that was obviously going to expand because of technology. Of course the government at the time could have made that investment themselves, but that was the whole point, take ownership off everyone and concentrate the profits generated, which amounted to billions of pounds a year, into the hands of those who could afford to buy the shares. Despite share issues to staff and some allocations of shares to ‘small investors’, the ownership largely fell into the hands of the big investors. And the drive to increase share price superseded everything else, including service. Asset stripping became the policy in BT, with over a hundred buildings and land sold for development in London alone and Royal Mail is well endowed in property, but selling it off is bound to have a more acute effect on customers in the mail trade, with longer distances to collect registered mail etc. Customer service has actually gone down in the privatisation years. Who hasn’t despaired of the call centre customer service experience? Who can be bothered to examine the bewildering array of choice of providers and their myriad ever changing tariff deals? One cultural thing that did linger in BT up until the time I left, was a unionised one, with around 80% membership amongst sub management grades and even a decent proportion in the lower ranks of management. This cultural attachment to the union, is even stronger in Royal Mail than it is (was) in BT, and I fully expect a huge vote in favour of industrial action, and a really solid response from the rank and file. I was a CWU rep in my time working at BT, so I mixed with activists from the postal side of the union and I know that they are not going down without a fight on this. But all may not be lost. Big political beasts have tried to privatise Royal Mail like Michael Heseltine and Peter Mandleson, only to be thwarted by a campaign of resistance, not only from the CWU, but from Tory MP’s and now probably Lib Dem MP’s in rural constituencies, where inevitably the service will get worse and more expensive, despite assurances to the contrary. It could well cost some of these MP’s their seats, so I do not discount a U-Turn on this policy by the government.